Congratulations! You have embarked on your journey to a straighter, healthier smile by using the beneficial and convenient Invisalign treatment. Now that you are ready to use your Invisalign aligners, you may wonder what type of maintenance they may require during the use and process. Proper care is essential to ensure the Invisalign aligners are kept in optimal condition. There are easy Invisalign etiquette tips and general care procedures that will guide you on your path of caring properly for your aligners. Use a Soft Bristle Toothbrush – You will want to use a toothbrush and cool water to gently clean your aligners before inserting them. Your goal is to remove saliva or tiny particles that may build up in your aligners. Avoid using toothpaste of any kind since the harsh substances in the ingredients can become abrasive and cause damage to the aligners. Soak Your Aligners – You will want to soak your aligners on a daily basis, preferably during meal time, by using the Invisalign Cleaning System crystals. Soaking your aligners on a daily basis rids bacteria and residue that can cause odor. Avoid soaking aligners in mouthwash or denture cleaner. These strong solutions can cause visible damage to the aligner. Speak to your orthodontist regarding Invisalign approved cleaning products such as foams, crystals, powders and tablets that will remove stains, kill bacteria and eliminate odors. Prevent Discoloration – Invisalign aligners are clear and invisible. You want to keep your aligners as clear as possible so that they are not noticeable to others while you are using them. Specific drinks such as coffee, tea, red wine, dark colored sodas and purple grape juice are all capable of staining your aligners and causing them to become permanently discolored. It is recommended to remove your aligners when consuming these types of drinks. As a rule, you will want adhere to drinking water only while wearing your aligners. You should remove your aligners when consuming any other types of drinks. Avoid Hot Water – Invisalign aligners are created out of plastic by using state-of-the-art equipment. Since the aligners are plastic, you will want to avoid exposing them to hot water or substances such as hot coffee or tea. The hot water can cause the plastic to warp, distort or melt parts of the aligners, causing them not to fit properly. If any type of damage arises you will be required to get a replacement. 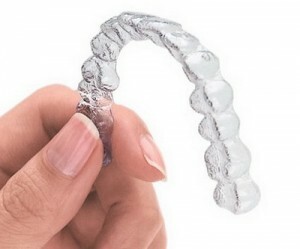 The replacement aligner can become costly and slow down the progress of your treatment. Store Aligners Properly – Your Invisalign starter kit includes two plastic aligner cases. These easy to carry cases should be used to store your aligners when they are not in use. The cases protect your aligners from becoming damaged and also prevent them from accidentally being thrown away, which frequently happens when patients store aligners in tissues or napkins while eating. Avoid Eating with Your Aligners Inserted – One of the main rules for using Invisalign is to always remove your aligners before eating. Chewing food while wearing your aligners will cause damage to the plastic causing it to become ill fitted, food particles to get trapped between your teeth and the aligner which can lead to tooth decay, plaque and odor, plus discoloration due to eating a variety of colorful foods and spices. Avoid Bending or Twisting Your Aligners – During the insertion and removal process you will want to avoid bending or twisting the aligner. When inserting the aligners you will want to begin at your front teeth and carefully place the remaining part of the aligner tray onto the remaining teeth. Avoid chomping or biting them into place. This can cause permanent damage to the aligners. During the removal process you will want to begin removing the aligners from your back teeth and gently lift the remaining part of the tray by working around to the front teeth. Properly caring for your Invisalign aligners will ensure that they are in top condition and providing you with the maximum results. Your goal is to follow your Invisalign program exactly the way your orthodontist has recommended. This requires patients to usually replace their aligner with the next stage about every two weeks. Use this helpful guide and tips for caring for your Invisalign aligners to stay on track in achieving your goal of a healthier, straighter smile.